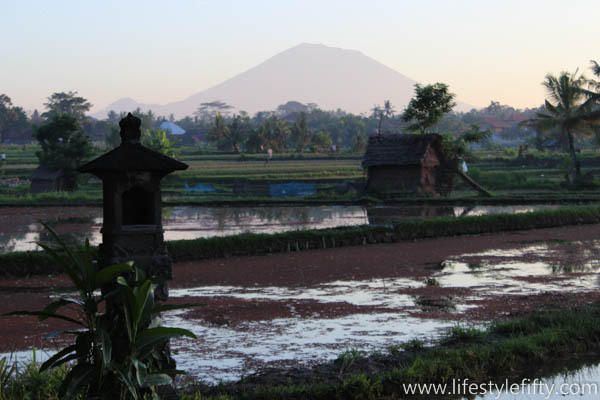 You are here: Home / Holidays, Travel & Adventure / Where to stay in Ubud, Bali. 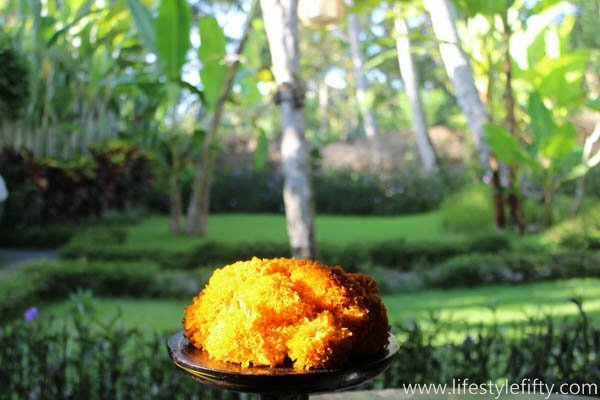 Where to stay in Ubud, Bali. Living only a hop skip and a jump away from Bali, means that it’s quick and easy to get to from Western Australia. It’s a bit like going to Western Europe from the UK, just more tropical 😉 Three and a half hours on a plane and we’re in a magical, and quite different climate and culture altogether. 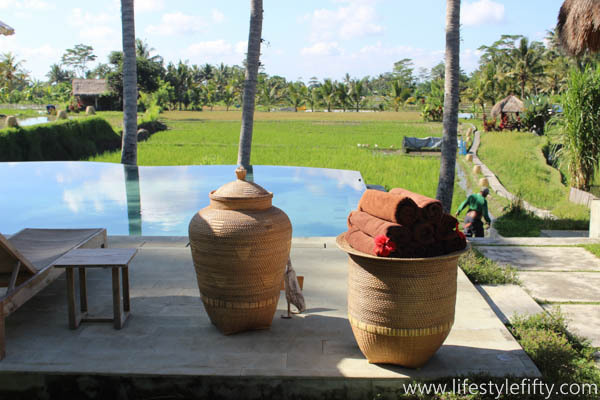 If you’re looking for where to stay in Ubud, read on. 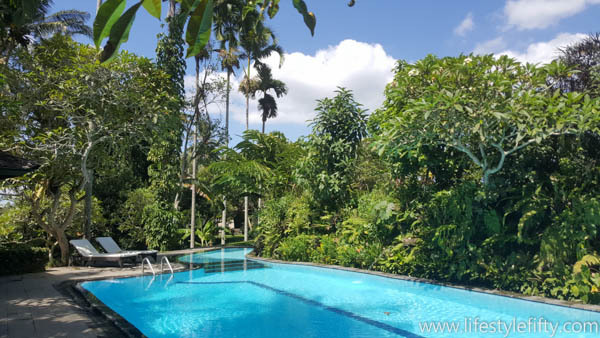 We visit Ubud as often as we can, especially when the prices are right and the airfares are cheap to Bali as it’s often less expensive to fly to Denpassar than it is flying to a capital city in Australia. With this kind of saving we can stay at Five Star hotels in Bali, which would also cost far more in Australia. 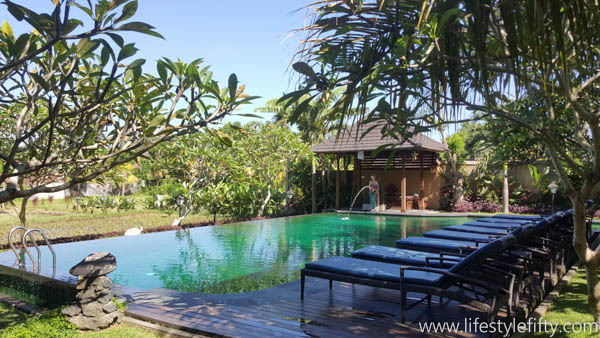 Dave and I love staying in Ubud and have some great suggestions for you from cottages to Five Star villas with private pools. 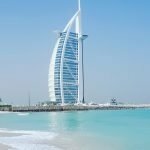 There is such a large selection of hotels to choose from that it can become mind-boggling – rest assured that our picks are each in their own way just lovely. Bali is a destination loved by many (and disliked by some) just like the memoir Eat Pray Love by Elizabeth Gilbert, which featured Ubud. Ubud was made just a little bit famous by this memoir, so can be busy in season – pick your time to visit. Check out not only when flights are cheapest but also check for time of year – if you don’t like rain, then don’t go in the monsoon season. Each time we visit, I have to admit, we love certain things about Bali, and get antsy at others. We meet not only Aussies, but many European and American travellers exploring the island which is great. You’ll get many recommendations for places to stay in Bali and the best resorts in Bali, but always check out photos and prices first. Exotic Bali where it’s all in the detail. 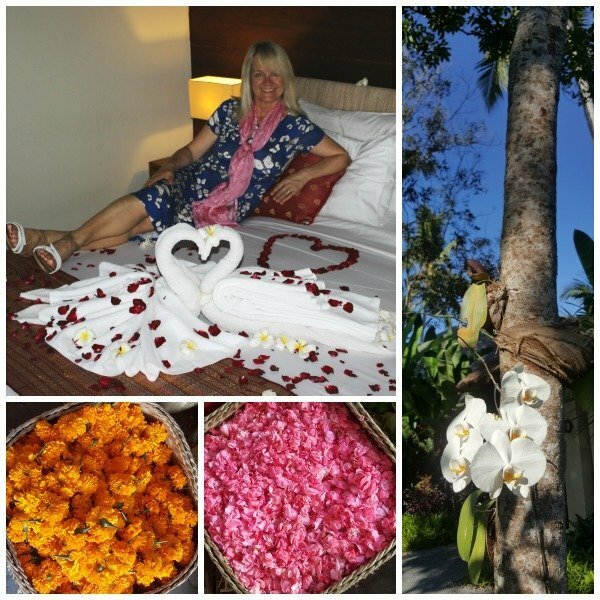 Kamkhya Villas offer a wonderful honeymoon welcome (on request) with flower petals and frangipani scattered artistically on the bed. I’ve been to Bali four times, the first time way back in 1983. And my how it’s changed over the years. Kuta consisted of little more than a few small roads girded by thatched huts and a rutted road leading to an uncrowded beach. I met artist Antonio Blanco in Ubud when his gallery was his house, now he’s deceased it’s a famous landmark destination. Four of us young backpackers drove a soft top jeep around the island and got held up by bandits in the mountains. Oh it was a wild and mysterious place back then. Bali is tropical so pack light – I’ve written about packing here: What to pack for a tropical break. Tropical fruit is widely available in Bali at the markets. 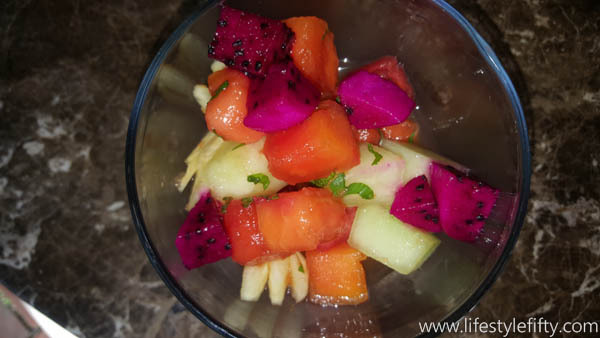 The beautiful cerise fruit in this picture is Dragon Fruit. I love Bali, especially Ubud, Bali’s cultural centre, with its arts scene and galleries, its beautiful scenery and rice fields, its increasingly great selection of restaurants, its exotic food, and its lovely places to stay and relax. 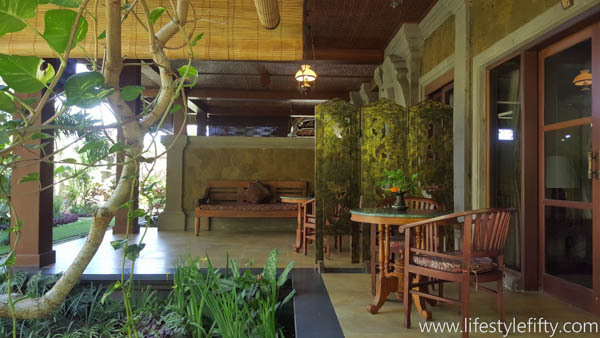 Most Ubud accommodation features lush tropical gardens and indulgent outdoor day beds. 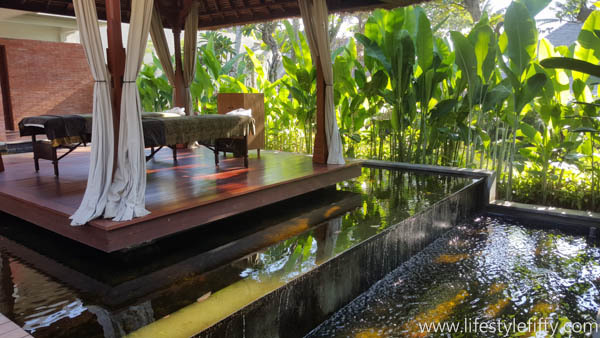 The best resorts in Ubud will offers spas and world class resaturants. I’ve written lots of posts about Bali over the years, and if you scroll to the bottom of this post, you’ll find a resource list linking to all of them. After lots of online searching, we snagged a great last minute deal. 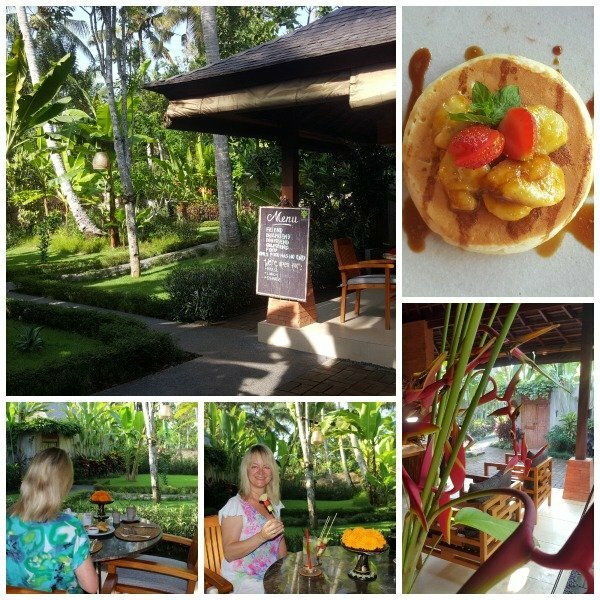 6 nights in a pool villa, which included breakfasts (3 courses plus fresh smoothies/juices) and daily high teas with Balinese cakes. 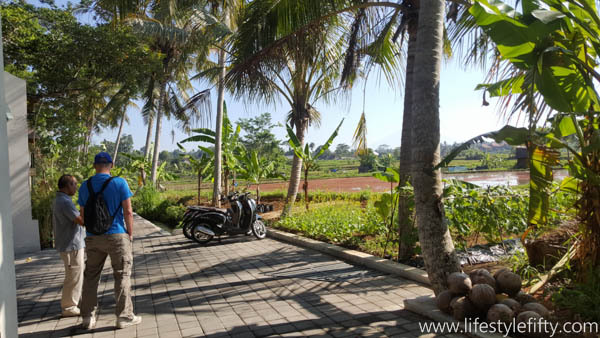 The villas are situated quite high on a ridge with peaceful views of rural Bali and working farmland. 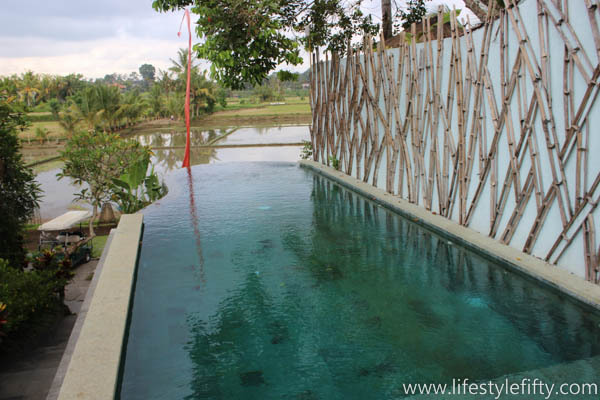 They’re about 15 – 2o minutes drive from the centre of Ubud (depending on traffic). Individual villas with private pools and walled gardens are spaced around two small public gardens. There’s a spa, two intimate dining areas and a reception area. 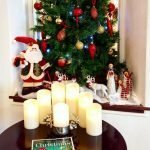 The hotel part of the establishment is convivial and the staff are super friendly, but you truly can get away from it all in your villa behind two ornate wooden doors. 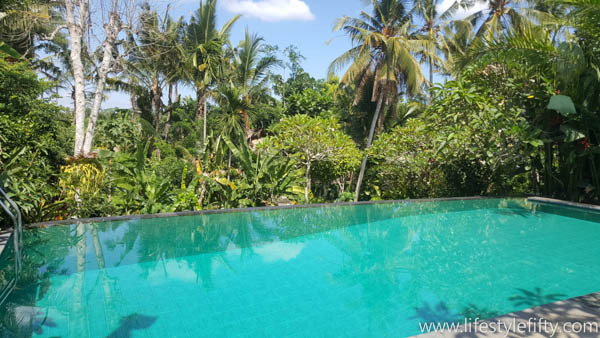 We wanted the privacy of a private pool given we were going during a very hot time, and jumping straight into that pool on our return from stiflingly hot walks or trips into Ubud was bliss. 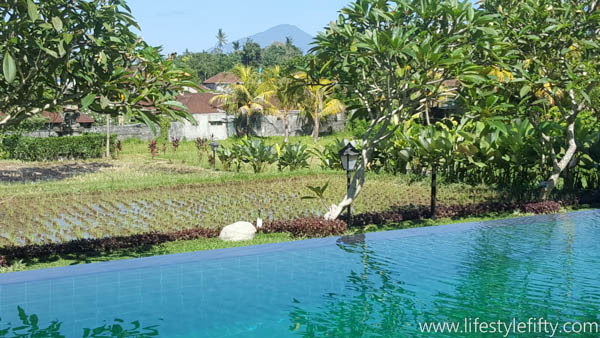 Booking a pool villa as opposed to a hotel room also gave us much more space and our small walled garden was private, but with a view out across rice fields and farmland to Bali’s highest mountan, Mount Agung. 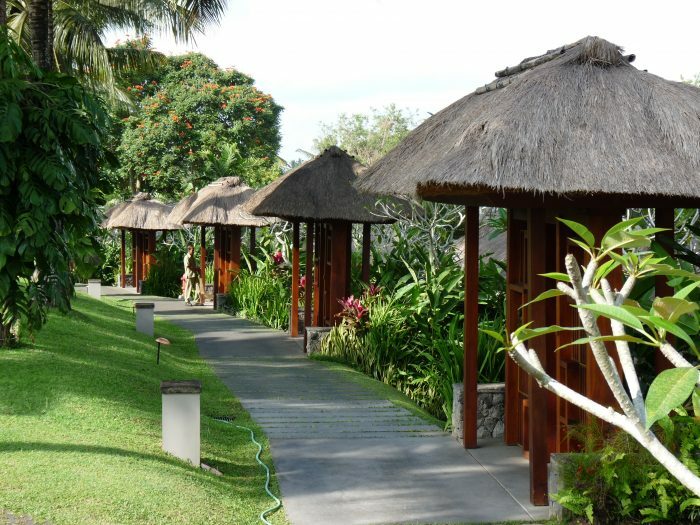 The spacious bedrooms are made to resemble traditional Balinese houses with high thatched ceilings and wooden floors. 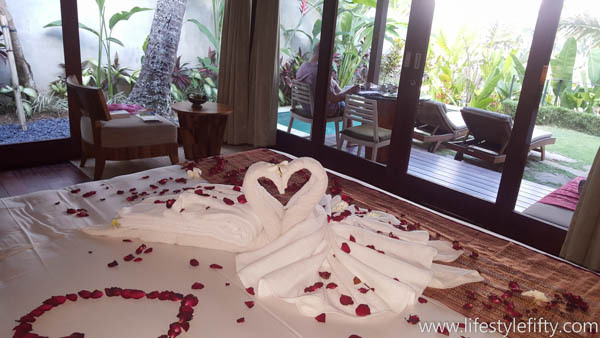 Samkhya Villas kindly upgraded us free of charge to a honeymoon welcome with detailing as above. 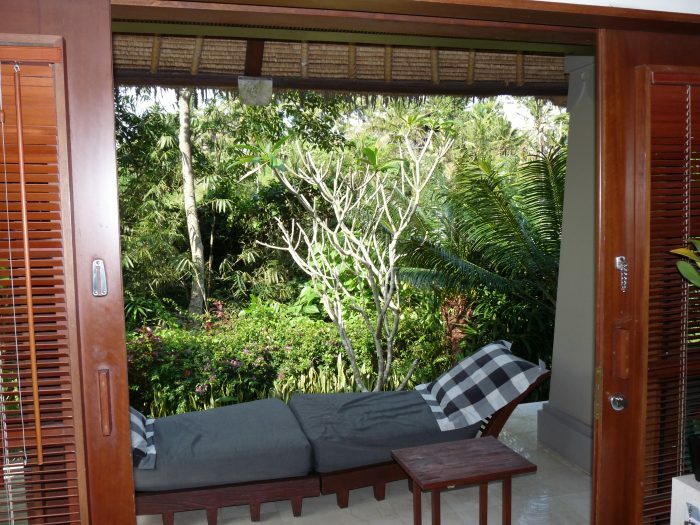 Balinese style can be quite dark, but these rooms aren’t dimsy and are kept light due to the floor length windows on two sides which overlook the courtyard garden, the pool, a small deck area and the paddy fields beyond. From the deck area we could see the farmers in conical hats laboriously at work in the rice fields, and we were amused by the antics of ducks and birdlife. It was a very rural scene and so peaceful. We often had high tea at the table on our deck, and if we preferred we could have had all our meals delivered to us in the villa rather than eating at the restaurant (most people did). Outside our villa was a small restaurant, with an overhead fan, three tables only, and a view across the small garden. We really enjoyed eating here, it felt like our very own restaurant as few guests ate here, and we came into contact with the staff who were all lovely and couldn’t do enough for us. A larger restaurant was due to open at the other side of the property after we left. 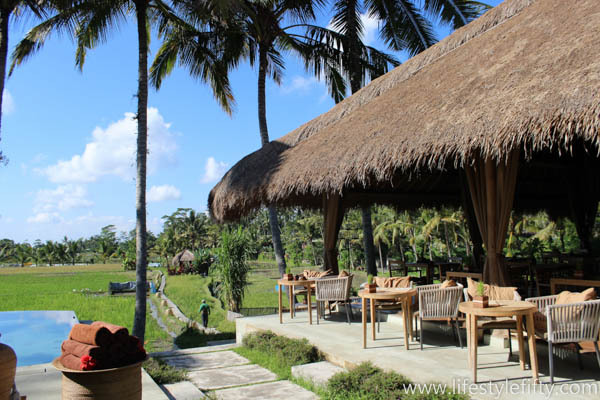 Some tables are situated in the garden, and some have a view of the farmland and rice paddies, above. The bathroom was roomy with cupboards, plenty of space to hang clothes or towels to air, and had large mirrors and a sink. Two free bottles of water were provided each day for drinking and cleaning teeth purposes. The bath and toilet are situated in their own outdoor (partially covered) walled courtyard accessed through a sliding door from the bathroom. While this eradicated smells, I was careful to light the mosquito coils (provided) at night to prevent being bitten on the bum by mossies! We would also quite often hear the scurrying of lizards. At the spa, mosquito coils are lit beneath the beds if requested. The Samkhya Spa offered fantastic treatments. I love spa treatments so made the most of the opportunity and had 4! Each treatment cost much less than Australian prices. I spent hours under a picturesque bale which is made private with curtains and situated on a deck surrounded by fish ponds and the sound of calming running water. Travel from the airport to Samkhya will take about 1.5 hours – book this through the hotel. You’re dropped at a small pick-up point about 800 metres from the resort, because the pathway is too narrow for cars. 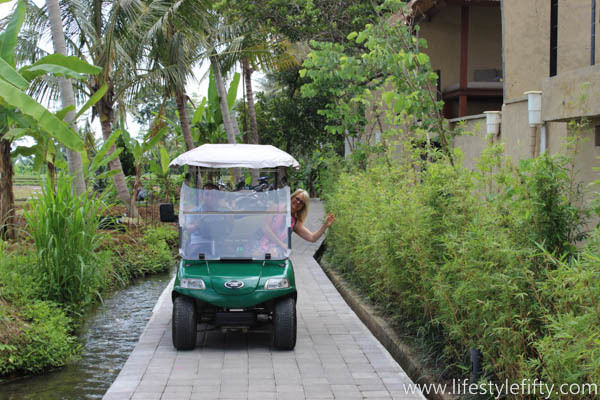 A golf buggy will be waiting to pick you (and your suitcases) up and you drive along a thin track beside rice fields and an irrigation canal passing two other villas which share the same access. To begin with this mode of transport was a bit of a shock! But we quickly warmed to the idea, especially at night when we returned from Ubud after a couple of Bintang beers – this is Bali after all! You can also easily walk this stretch though like the locals do – it takes about 5 minutes. 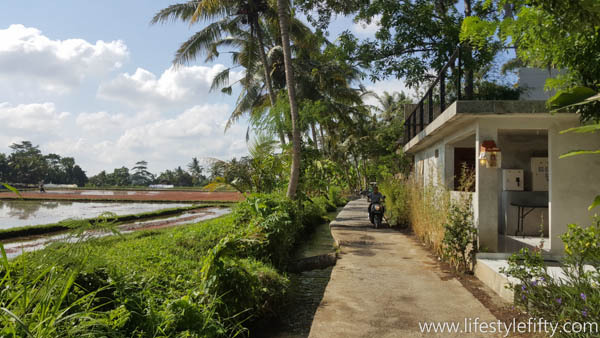 It will take you about 50 – 60 minutes to walk along the main road from Samkhya into Ubud central. The pavement is off and on, and rutted (as are nearly all pavements in Ubud) and the cars and scooters whizz close-by, so you need to be aware. You’ll go past lots of interesting art galleries, little restaurants and other hotels, so it is worth the walk at least one day. On other days there are regular, complimentary shuttles to and from Ubud, first via the golf buggy then via a mini bus which drops you (and then picks up) from the Grand Palace near the Ubud market. The trip takes about 15 – 20 mins but it feels like less. 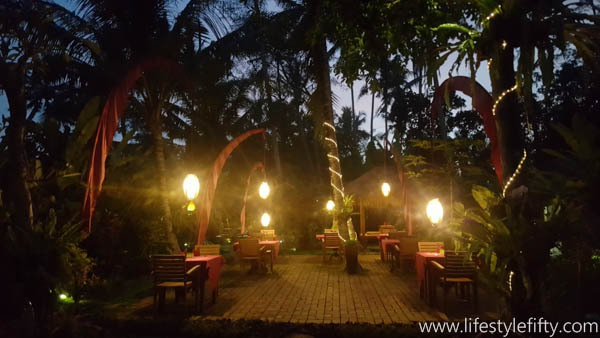 One night we requested a non-scheduled pick-up from Bridges restaurant just outside Ubud – Samkhya charged about $7 for the pick up. If you haggle with a taxi you will probably get one a bit cheaper for about $5. Tips: WiFi – was free at Samkhya and available in the restaurant area, and in our room. The bed was comfortable and spacious – two king singles pushed together. Slippers and gowns are provided in the room along with a safe and A/C. The staff at Samkhya really made our experience wonderful. 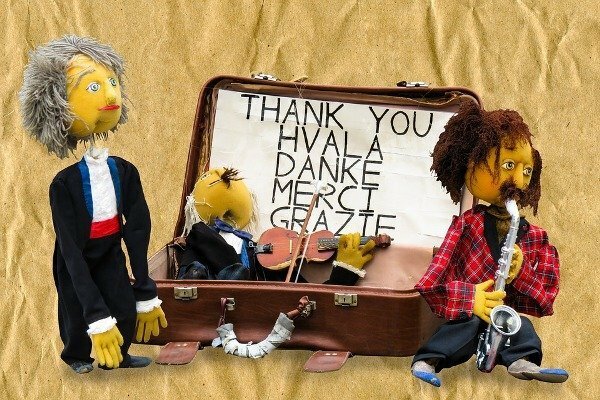 At the end of 6 days they felt like friends. During our stay they made sure that our every need was catered for. 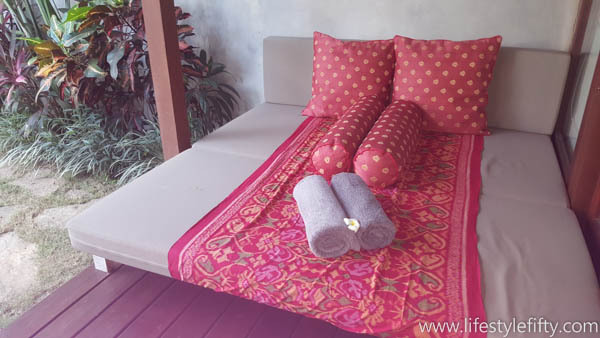 Sister Villas to Kamkhya are the Ubud Padi Villas which are right next door and were built a few years earlier than Samkhya by the same developer. 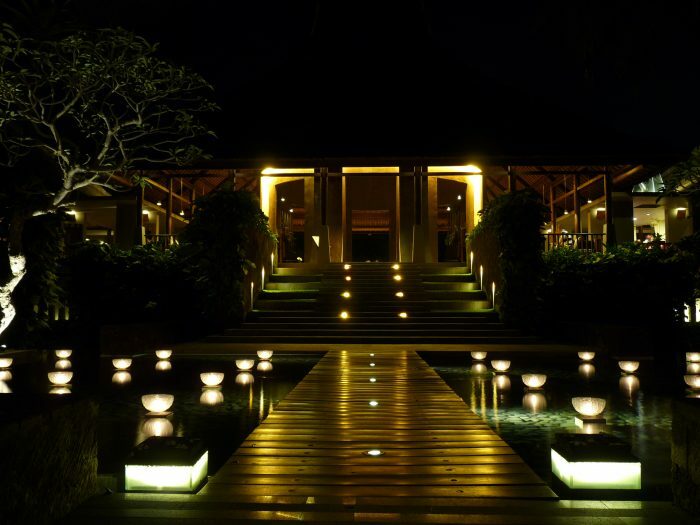 There’s a small reception area (below) and at the end of a garden a secluded spa area beyond the open air restaurant. 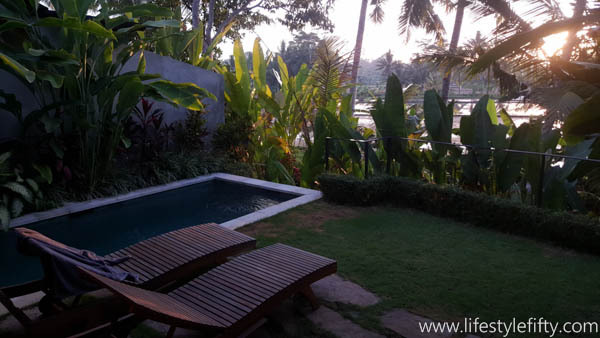 Rooms are similar to Samkhya’s but the rice paddy villa views are situated directly over a public walkway, so you do feel closer to civilization. The valley views over trees are more secluded, below. Each villa has its own private pool, and there’s an infinity pool at the entrance. We didn’t stay at Kenanga, but we thought how lovely it looked sitting on a slope above the rice terraces, especially when it was all lit up at night. So we did look at one of the rooms, wander the grounds and eat at Terracotta Restaurant (above). We could walk to it in 5 minutes from Samkhya. 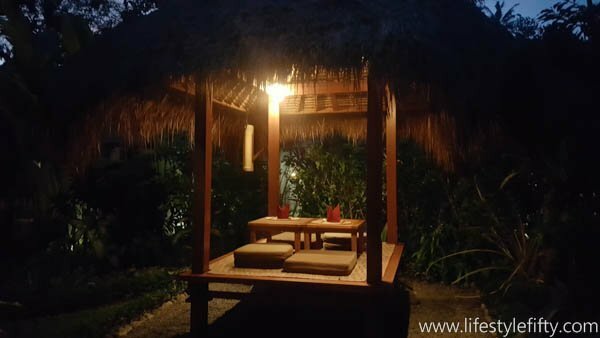 There’s an open sided dining room with a beautiful view – and it’s all lit up like fairyland at night.We had a lovely 2 course meal and dessert to share including two Mint Mojitos for me and a large Bintang and G and T for him. The bedroom we looked at had a balcony overlooking the rice fields – the bed looked smaller than Samkhya’s singles pushed together, but the room was more modern, and the bathroom was ensuite. 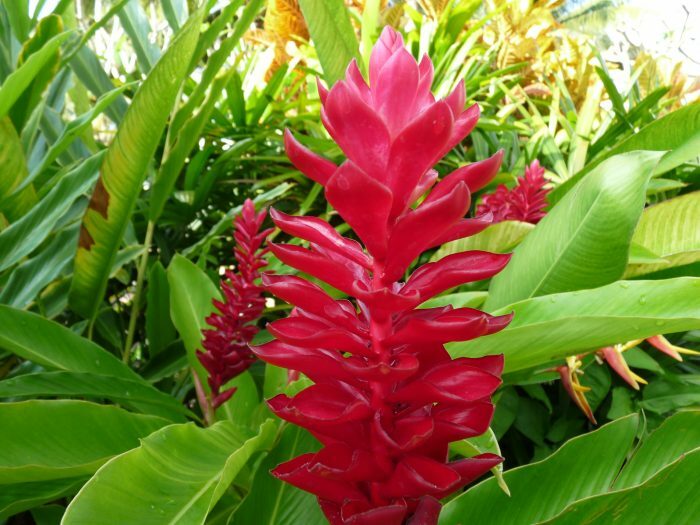 There are 21 Rooms and bungalows situated in tropical gardens. 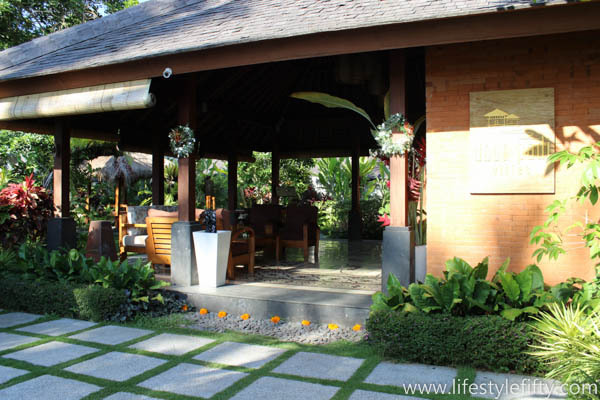 The facilities are modern and bright, but blended with Balinese tradition. 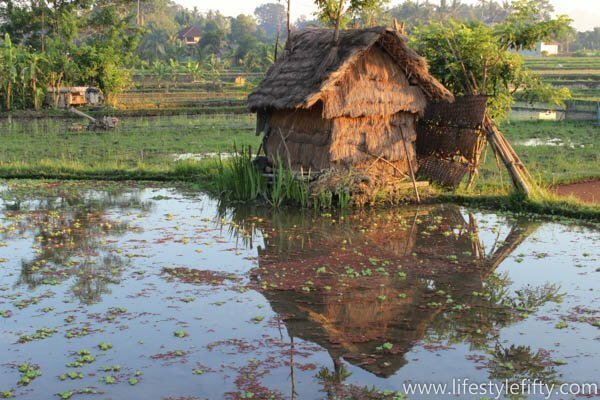 You can choose from garden rooms overlooking the rice fields or bungalows which are apparently larger. I’d been eyeing this property up on lastminute.com because it was coming in at an excellent price and the reviews on TripAdvisor were all good. So when we chanced to walk past the entrance on our way into Ubud one day we asked if we could have a look around. I would definitely consider staying here as a more budget option next time, particularly if there was no need or desire for a private plunge pool (ie in cooler weather perhaps). 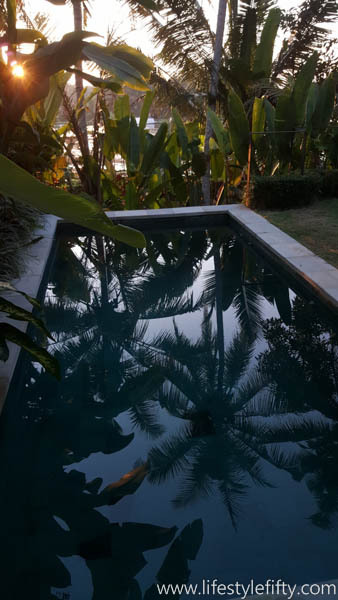 There are three very pretty swimming pools at Ananda, situated in different and beautiful locations accessed by a network of paths and gardens around private rice fields. It’s quite a big property (low rise) but you don’t feel engulfed as the rooms are nestled around rice fields, trees and gardens. Expect traditional style rooms with dark wood fittings and tranquil balconies (above and below). The bathroom I looked at was a bit dated, but clean and serviceable nonetheless. 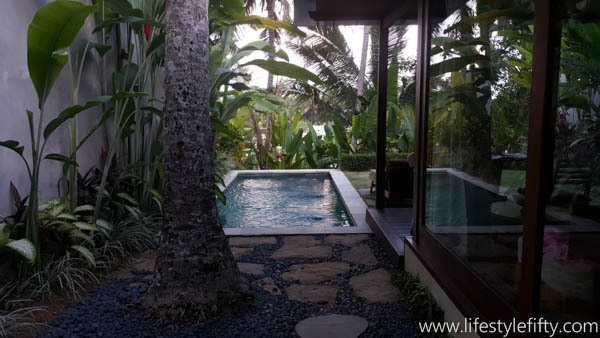 I loved the sense of space at Ananda, and the pathways leading to different pools and locations. 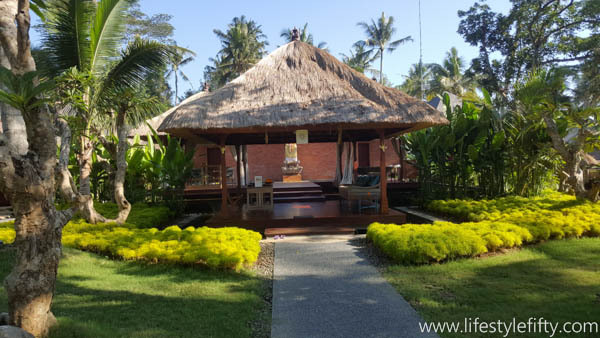 There’s also a large yoga retreat situated peacefully on its own at the back of the property and I believe Ananda is popular for yoga groups. Tip: Request a room at the back of the property as it will be quieter than those closer to the road. Also the upper rooms have their own private balconies. Lower rooms also have balconies, but are not quite so private. 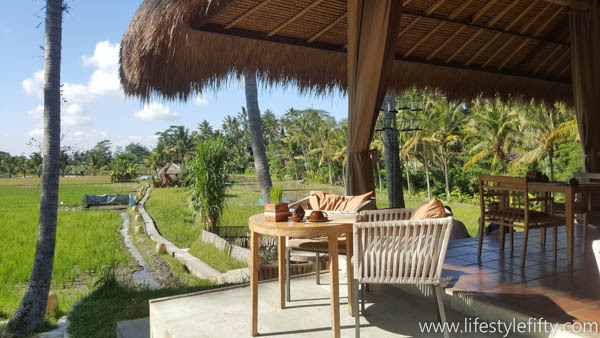 I was informed that Ananda guests had use of two ‘sister’ hotels pools and facilities including Bliss Ubud Spa and Bungalow just up the road which has the most beautiful pool with a gorgeous rice paddy view (below). 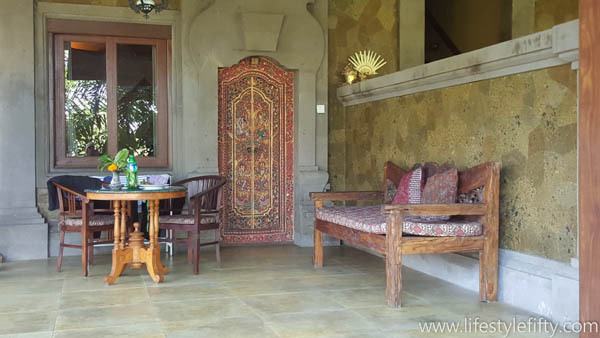 Rooms and balconies were decorated with traditional Balinese furniture. There are so many resorts in Ubud, that it’s hard to pick just one. 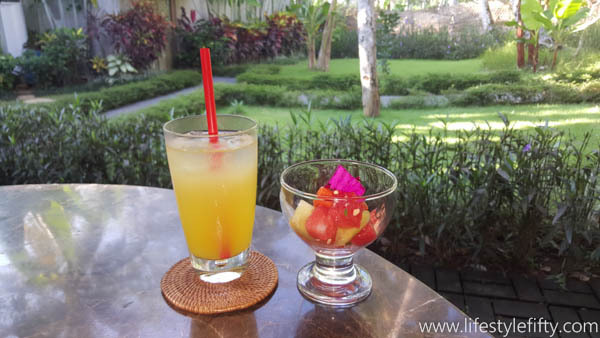 However one Ubud resort stands out above other luxury Ubud hotels for lots of reasons. It’s out of the Ubud Centre which can be hectic. It has beautiful grounds and gardens. The rooms are lovely. The restaurant is superb. There are activities on offer such as bicycling and free yoga. It’s secluded. 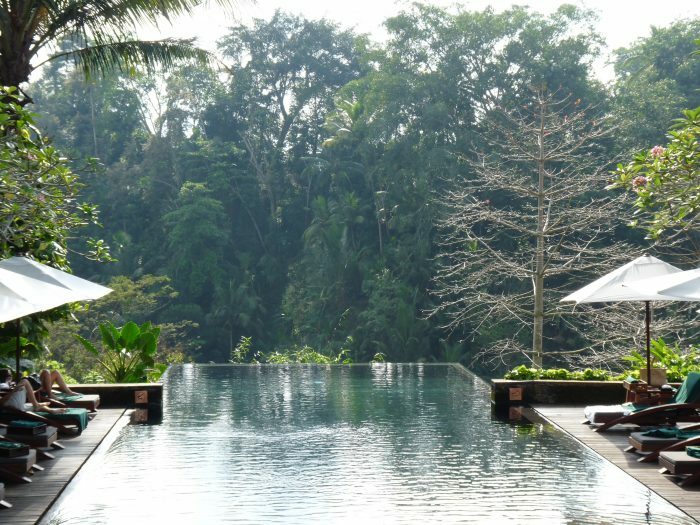 Maya Ubud Resort & Spa is luxurious and gorgeous. We’ve stayed here and I would return in a heartbeat. The resort is hugged by verdant jungle and situated between a steep river valley and swaying fields of rice. Garden Villas and Pool Villas are designed to co-exist with nature, set in their own walled, tropical gardens. Enjoy two horizon pools which hug the cliffside. There are 10 hectares of hillside garden set high above the Petanu River which flows through the valley some 30 metres below. Towering silk trees and jungle creepers with waxy leaves as big as satellite dishes rise catch your attention as you walk down the steep steps to the hideaway horizon pool, and the River Cafe that hugs the last bit of hillside before it plummets dramatically into the river. If you prefer, there is a lift for the fainthearted. For those of you who arrive at night, you’re in for a magical welcome. 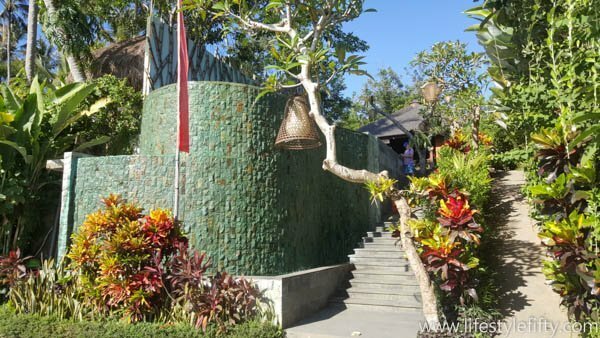 A fabulous entrance will then lead you through to what we think are the best villas in Ubud. The Maya Ubud has thatched Spa treatment pavilions dramatically cantilevered over the rapids of the Petanu River. A spa treatment might consist of a massage and then a flower bath when a canopied bathtub might be filled with bucketfuls of frangipani, and rose, orange or lime bath crystals. You’ll be given a healthy snack and some fresh lemon juice, while you relax and listen to the rushing sound of the river – an experience which can best be described as heavenly. 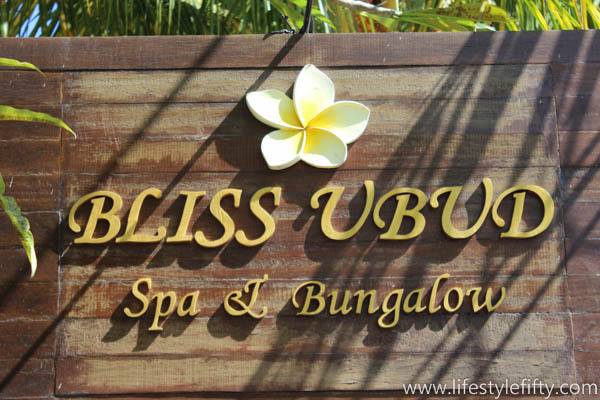 It has to be the best spa in Ubud for me. We stayed in a pool villa which was quiet and secluded. I thoroughly recommend the pool villas. They are situated in a peaceful part of the resort with their own private entrances leading to a small garden with a sparkling swimming pool. 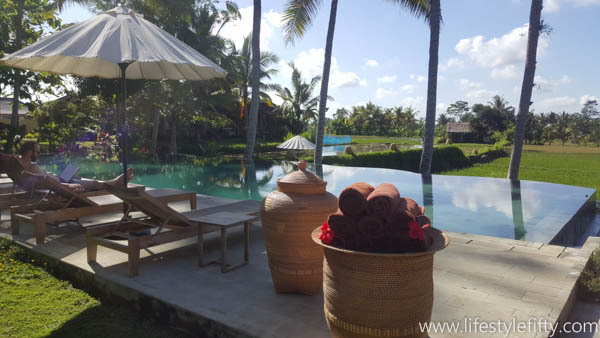 This luxury Ubud accommodation is hard to beat. 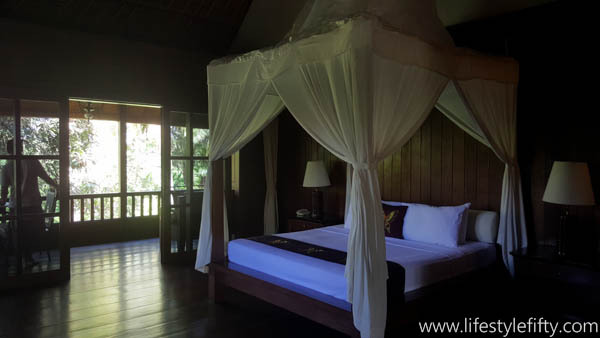 Inside the ornate villa gate you’ll find your private room which has it’s own balcony with a day bed, and inside the area is spacious and comfortable with a sitting area, bedroom area, desk and a large bathroom. At the Maya Ubud the restaurants are all rooms with views and mostly open sided, leading to water or fountains or dramatic valley vistas. 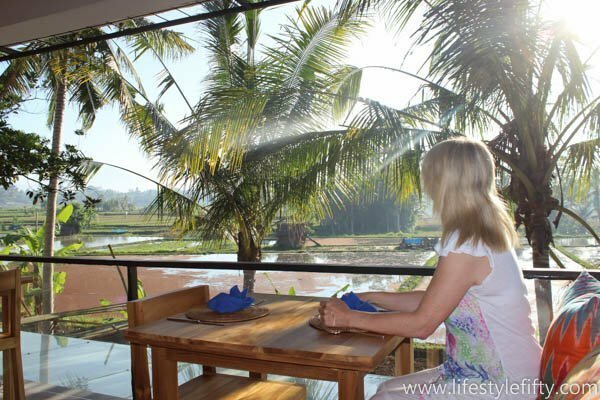 Our first breakfast was beside a pond with a water feature in view of two stone carved elephants complete with checked yellow rugs and chairs with bright yellow cushions. 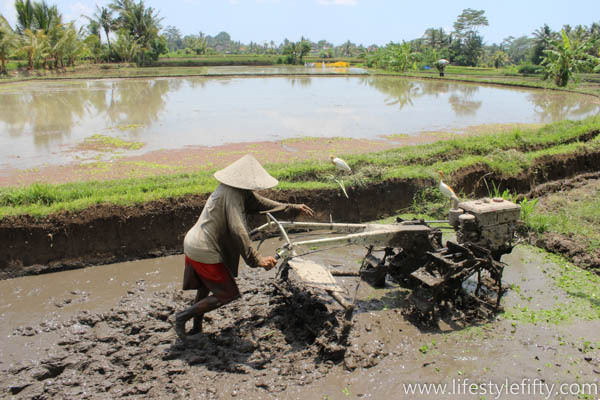 You might also like this post about Ubud. 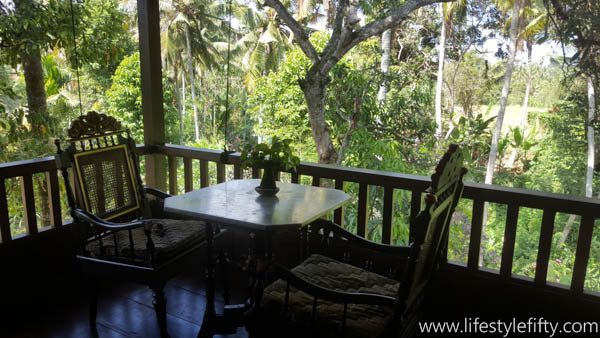 For some of the best hostels in Ubud you might like this post. Have you been to Bali? Where did you stay? 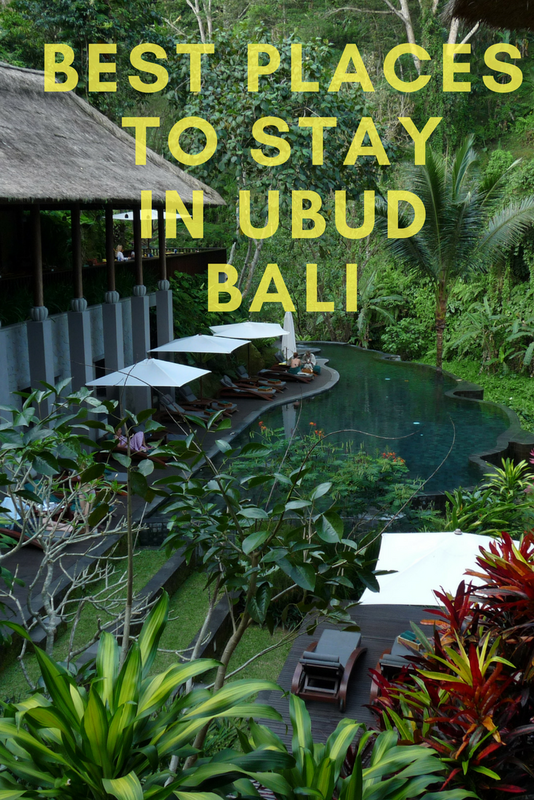 Will you go to Ubud? Where would you like to stay? 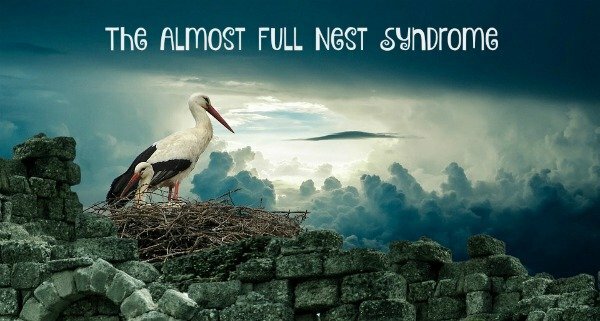 Please chime up in the comments! 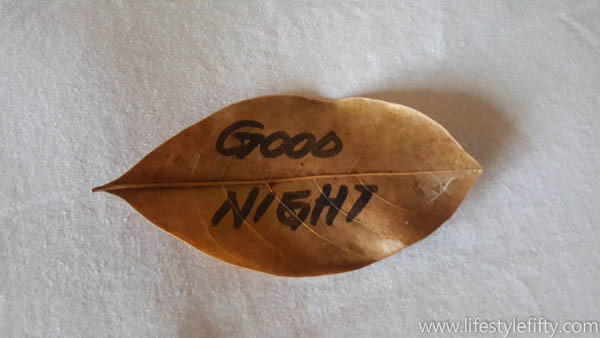 I hope you’ll find the following posts on my travel blog ZigaZag useful too. Why Take Holidays in Bali? Would you retire in Bali? Disclaimer: There are affiliate links in this post from which I stand to earn a small commission if you purchase from them, but at no cost to you. 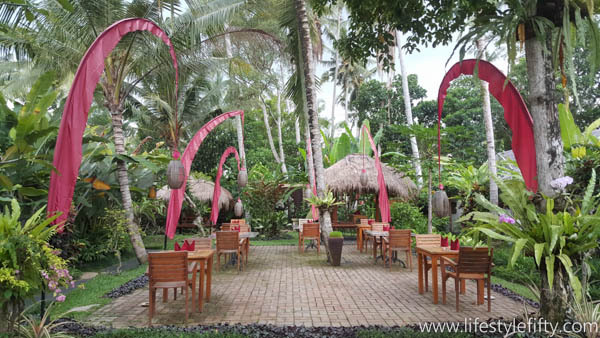 We are staying at the Udhiana Resort for 3 nights in May for our 44th Wedding Anniversary can you suggest nice restaurants with good food to eat in Ubud whilst we are there? We loved a restaurant overlooking the river, I can’t remember it’s name, but it’s very visible by the bridge. 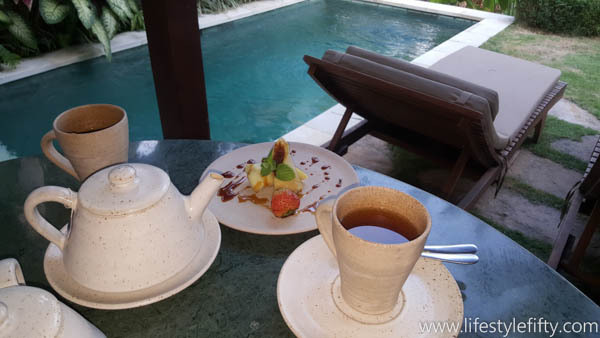 We stayed at Maya Ubud a few years ago and the dining there is superb (but a bit pricey). 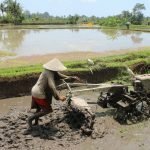 I’ve written about things to do in Ubud in this post https://zigazag.com/things-to-do-in-ubud-bali/ and here more info from our experience. 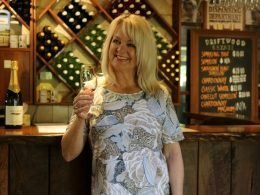 https://lifestylefifty.com/where-to-stay-in-ubud-bali/ Have a wonderful 44th wedding anniversary – Congratulations! Have Fun! Looks very beatiful and relaxed place, Thank you for sharing. Hi, We went to Bali in July 2014 and before that in 1983, the change was Big! We went to a lot of places in our 3 weeks there. Bintang and Uluwatu on the Bukit peninsula, nice, Legian where we had first stayed all those years ago – 3 Brothers, an authentic styled resort. Good accommodation. Then to Ubud to stay at the Yoga Barn for a few days, accom was reasonable and quiet. Then onto Tja…I can’t remember the name but it was the oldest resort in Bali set on an embankment of the main river and it had 2 pools plus cold bath pools with amazing carvings. We hired a scooter… ha ha not so bad after all and travelled to the Green school for a tour. 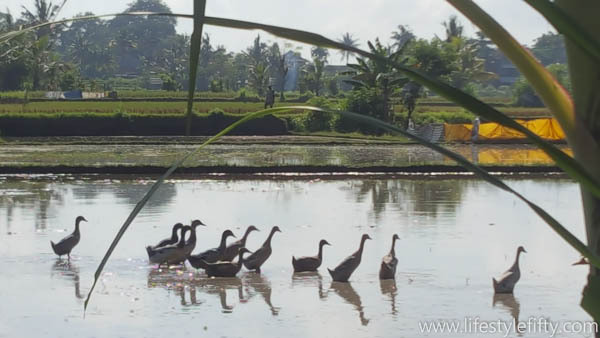 We on some paid tours like white water rafting(great fun), bike riding in the paddy fields and trying the coffee Luwak.I really liked it there, but my husband wasn’t so fussed, he didn’t like the rubbish, pollution, hassle and crowds but I liked the atmosphere. Especially the cultural differences. I’d go back again but don’t think he would…. Hey Karen, thanks for your lovely tips and add-ons about Bali. Sounds as if you know it pretty well. Yes, how about the changes since 1983 – incredible. You’re a bit like me, I loved the atmosphere and the culture, but I think my hubby would prefer to go elsewhere. Wow, what memories. I too first went to Bali in 1979 and then again in 2014. 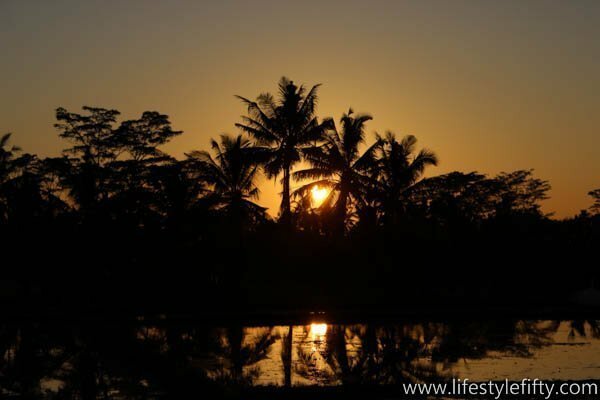 The changes in Ubud were incredible – some better than others! I avoided going back so that I could keep my memories of a quiet, reasonably un-touristy Bali intact – but it is such a beautiful island. Jan from Retiring not shy! Love love love Bali ever since my first visit in 1978! 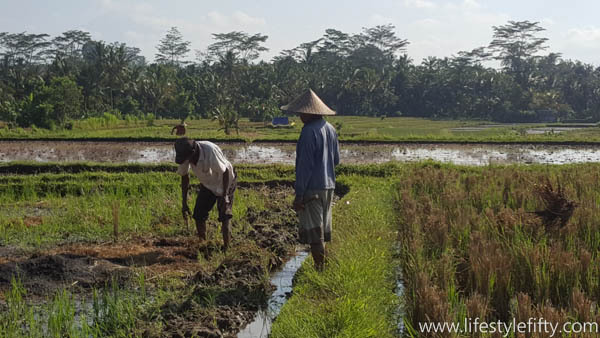 But I find Ubud too busy and westernised these days and we are constantly looking for more authentic experiences. It’s a challenge. I tend to agree Jan. I was looking back at old photos the other day and realised how much Ubud has changed. Time to find somewhere quieter and more authentic methinks (before mass tourism does). Ugh that Dengue was the pitts! Your villa looks gorgeous. The villa is one to return to Erin, for sure 🙂 Glad you are better now. These look gorgeous & relaxing Jo. 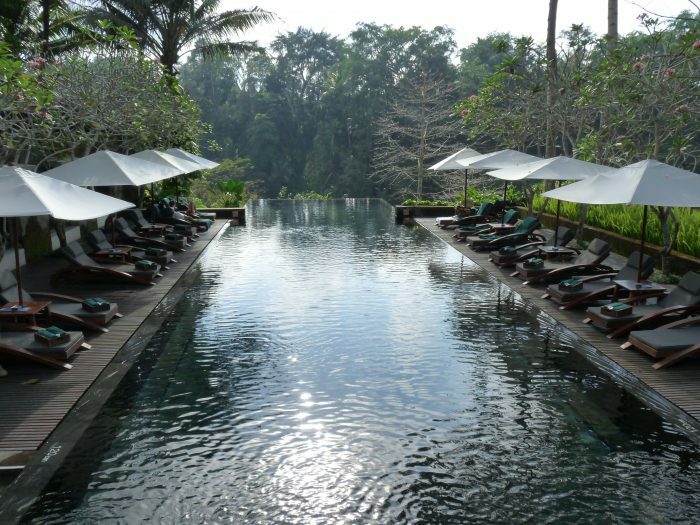 We are not a fan of Bali, though have been there a couple of times, but these resorts in Ubud could see me hankering for a return visit. Hi Jill, I know, Bali isn’t everyone’s cup of tea. But yes, the resorts can certainly weave their own magic. Hi Jo, I would stay in all of these! Did you consider hiring a vehicle to drive yourself on your recent visit and if you did would you have been able to leave a vehicle at the end of the smaller (golf buggy) pathway safely? Hi Jan, no we didn’t consider hiring a vehicle ourselves. The roads are pretty hectic – although I’m sure if you go north they are quieter and less manic. I’m sure if you contacted the Villas they would be able to let you know if you could leave a vehicle at their pick-up point. 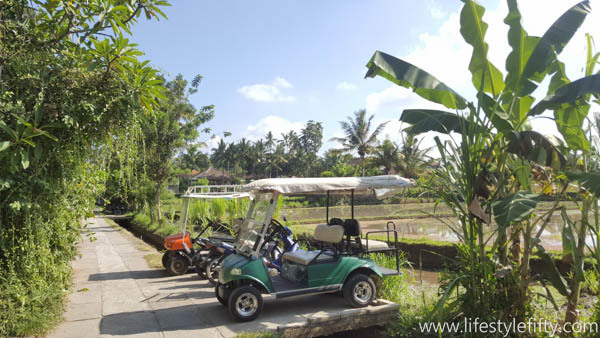 As far as safety is concerned, our driver said Ubud is still ‘safe’ – once (to our incredulity) they left the keys in the golf buggy for someone else to pick up while they ferried us into town! Oh I loved my trip to Bali. 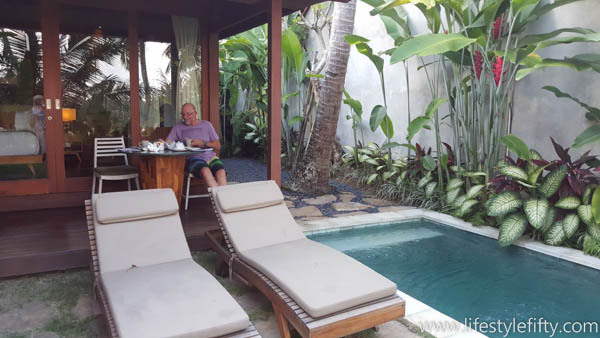 I stayed in the madness of Kuta and then escaped for a few days to Ubud…ahh. Great tips Jo. Looks like you had a wonderful time. Thanks Sue, Yes Kuta has changed since we were there in 1983. Ubud is quieter, but I think there is discovering of more serenity to come. I have only been to Bali once with my daughter a few years ago and I fell in love with it. We stayed in Seminyak which was fine, but next time I would probably like to stay out of the hustle and bustle. We have actually booked to stay at a resort in Bintang later on in the year so I’m looking forward to it immensely. 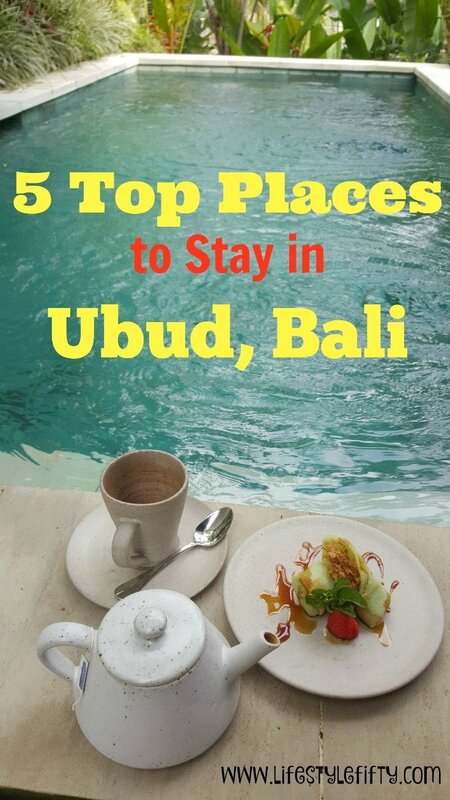 However I would really love to stay in Ubud. We did a day trip here and I loved it. All of the places you reviewed look wonderful – I don’t think I can choose between them! 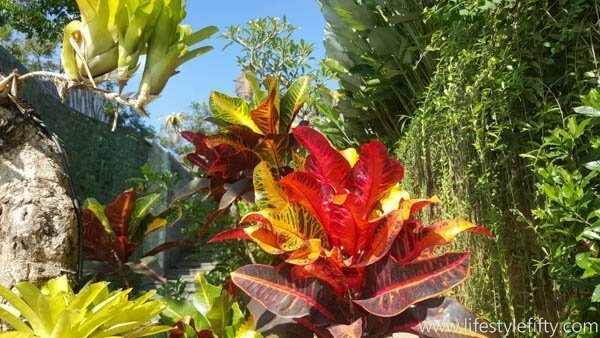 Glad you enjoyed a little virtual visit to Ubud, Kathy. 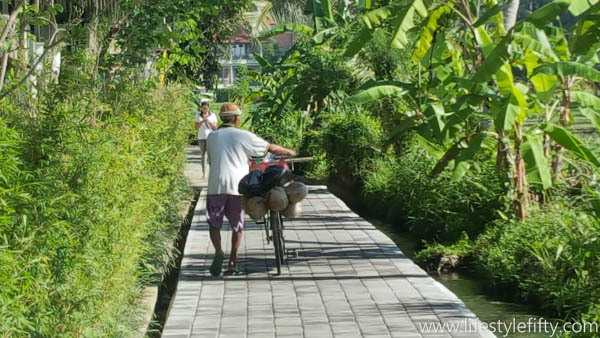 Yes, Ubud is a very special place and it’s easy to get behind the hustle very quickly. Have yet to go to Seminyak but it’s on my list. Enjoy Bintang!